1. Alanko K, P Susitaival, R Jolanki, L Kanerva. Occupational skin diseases among dental nurses. Contact Dermatitis 2004; 50:77-82. 2. Austin A, R Basker. Residual monomer levels in denture bases. Br Dent J 1982;153:424-426. 3. Bauer A, U. Wollina. Denture-induced local and systemic reactions to acrylate. Allergy 1998; 53:722-723. 4. Dimova M, V Dosseva, I Stoeva. Clinical report of nickel allergy after metal-ceramic restorations. Problems of Dentistry 2005,XXXI(2);33-37. 5. Geukens S., A Goossens. Occupational contact allergy to (meth) acrylates. Contact Dermatitis 2001; 44:153-159. 6. Hamann C, L De Paola, P Rodgers. Occupation-related allergies in dentistry. J Am Dent Assoc 2005, 136:500-510. 7. Ivanova I. Intraoral contact hypersensitivity to prosthodontic biomaterials. Dissertation 2008, Medical university, Faculty of dental medicine, Sofia, p.173. 8. Kanerva L, A. Lahtinen, J. Toikkanen, H. Forss, T. Estlander, P. Susitaival, R. Jolanki. Increase in occupational skin diseases of dental personnel. Contact Dermatitis 1999; 40:104-108. 9. Kanerva L, K Alanko, T Estlander. Allergic contact gingivostomatitis from a temporary crown made of methacrylates and epoxy diacrylates. Allergy 1999; 54 (12):1316-1321. 11. Lunder T, M Rogl-Butina. Chronic urticaria from an acrylic dental prosthesis. Contact Dermatitis 2000; 43:232-233. 12. Sadamori S, H Kotani, T Hamada. The usage period of dentures and their residual monomer contents. J Prosthet Dent 1992; 68:374-376. 13. Shultz J, E Connelly, L Glesne, E Warshaw. Cutaneous and oral eruption from oral exposure to nickel in dental braces. Dermatitis 2004; 15:154-157. 14. Spiechowicz E, P Glanz, T. Axell, P. Grochowski. A long term follow-up of allergy to nickel among fixed prosthesis wearers. Eur J Prosthodont Dent 1999; 7:41-44. 15. Stoeva I. Allergic reactions to dental alloys in prosthetic dentistry. 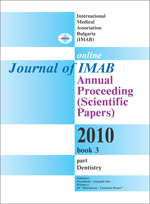 Problems of Dentistry 2006, XXXII:64-69.